A superfast unmanned military plane traveled at 20 times the speed of sound and managed to control itself for three minutes before crashing into the Pacific Ocean in a recent test, military officials said. The prototype Falcon Hypersonic Technology Vehicle 2 (HTV-2), billed as the fastest aircraft ever built, splashed down in the Pacific earlier than planned on Aug. 11 shortly after launching from California's Vandenberg Air Force Base on its second-ever test flight. Despite the problem, the aircraft reached speeds around Mach 20 (about 13,000 mph) and was able to control its flight for several minutes, officials said. "HTV-2 demonstrated stable, aerodynamically controlled Mach 20 hypersonic flight for approximately three minutes," said DARPA director Regina Dugan in an Aug. 14 statement. "We do not yet know the cause of the anomaly for Flight 2." The HTV-2 is part of an advanced weapons program called Conventional Prompt Global Strike, which is working to develop systems to reach an enemy target anywhere in the world within one hour. It launches on a rocket, then comes streaking back to Earth at enormous speeds, at times heating up to temperatures of nearly 3,500 degrees Fahrenheit. DARPA officials said last week that the Aug. 11 test flight collected more than nine minutes of data during the entire mission. 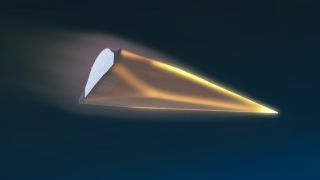 An analysis conducted by an independent engineering review board prompted engineers to adjust the HTV-2's center of gravity and make several other changes before the second test. Those fixes apparently corrected the first problem, officials said. "An initial assessment indicates that the Flight 2 anomaly is unrelated to the Flight 1 anomaly," said Air Force Maj. Chris Schulz, DARPA HTV-2 program manager. Another independent review board will look into what went wrong with the second flight test in the coming weeks, DARPA officials said.